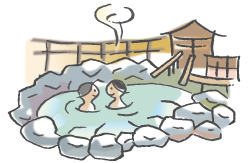 Yutagawa Onsen that is one of Shonai three hot water with Shonai oldest history. One white heron which suffered wound in 712 (about 1,300 years ago) falls in marsh overgrown with reeds, and it is said that we healed wound with hot water which sprang out there. Warming, no to add water to. We can thoroughly enjoy hot water which has a high quality, and is soft by gravity-feed irrigation. Used seasonal ingredients removed from the sea, mountain, river of Shonai and rice field and field; (feast) is one of pleasure, too. Please enjoy good luck of Shonai replaced in season. ■Access Terminal gets off Tsuruoka Station by bus for Yutagawa Onsen for 30 minutes. It is ten minutes by car from Tsuruoka I.C. In this hotel, we prepare Japanese-style room for exclusive use of pet companion near the first-floor entrance. In addition, please note that you cannot receive big dog. １．Please refrain from mudabo enoaru doggy. ２．In addition, acceptance becomes doggy three years or older as doggy that age is too childish tends to continue barking. ３．After having come, please stay by car when you continue barking. Thank you for your understanding. We charge cleaning charges once when we guide in hall. ４．On the Japanese-style room use of pet OK, we have about one of them on "cleaning charges 2,100 yen/1st". ５．When you stay, tell about Details of pet joining in by all means. ■Others ※For further information, please check our web site.